Born on January 3 1910- 1953. 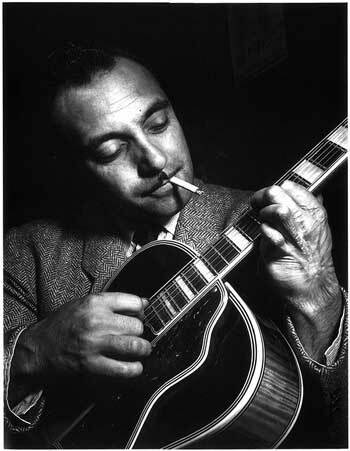 As a child Django Reinhardt grew up a gypsy, born in Liberchies, Belgium died on May 6, 1953 in Fontainebleau, France. He was had no proper education and was pretty much illiterate. Although it is hard to tell, but some say his father was a musician and his mother a dancer. He taught himself a combonation of a guitar and banjo. When he was in his early teens he was already playing at clubs in Paris. In the begining of his career he played popular french pop songs but became interested with American Jazz, especially Duke Ellington. Whom I would say is one of his inspirations along with Louis Armstrong and Joe Venuiti. He made a mix of American Jazz and traditional Roma and European music. There was a tragic fie in 1928 where Django lost the use of two fingers on his left hand; a tragic thing to lose for a guitar player. It took him 2 years to recover but he slowly began to play his guitar/banjo again. He had an interesting way of playing with his thumb and two fingers. He toured with Duke Ellington in 1946 but he did not win over the American crowd. He also toured with the famous violinist Stephane Grappelli and formed the Quintet of the Hot Club of France. Question 1. What about your musicions sound do you like? How does it affect your mood? What does your sound remind you of? Answer: I love the combination of guitar and banjo, to me it is unique and I don't listen to it very often. The music puts me in a peaceful mood, it makes me relax. It reminds me of an old jazz club or an old movie or the 1920's. Question 2. What does your musician sing about? * What are some of the major themes or subjects of the songs? If they do not sing, how can you interperate the music or sound? Answer: Since Django does not sing in his songs, I can interperate the music by the type of music, so if it puts me in a certain mood. Or whether it's a fast happy sound or a slow melancholy sound. Question 3: How does your musicians music reflect his or her time period? Was there anything happening in the world or music industry that influenced th e sound? Answer: I would say he started his music career around the 1920's, that is when jazz was becoming popular. He was playing in French clubs during World War Two, which he expressed his somber mood through his music. He wrote a song called Nuages which means clouds in French.